A review by Vanessa Bunn for EXTRA! EXTRA! Falling snow is simulated on the stage curtain through lighting designed by Tim Mitchell as a chattering, expectant audience spills into their seats at The Peacock Theatre. The curtain lifts to reveal a wonderfully homely scene, silencing the crowd and drawing us into the story. The family home scene is simple, warm and easy to relate to, Christmas stockings hang on the stairwell, and wellington boots stand by the door, ready for some action in the snow. An unwitting boy sleeps upstairs, oblivious to the adventures he will experience the following night when the wonderful snowman he painstakingly builds comes to life and takes him on an Arctic escapade via the night sky. Animated Mum (Allessandra Mazzetti) and Dad (Matthew Graham) are deliberate and comic in their characterisations, milling about the house fussing over the Boy (Joseph Darcey-Alden on Dec. 10th), making last minute Christmas preparations. When the boy wakes to discover the ground and trees which overhang his house blanketed in snow, his reaction is as expected - he races downstairs and out the door to get to work on his icy friend. He rolls a growing snowball off stage right and left up-sizing each time, much to the wonderment of the children and amusement of the adults. A festive looking crowd who will reappear later on as carollers facilitate the final touches, and once the boy has raided the coal-bucket and hat stand for features and accessories, The Snowman (Cameron Ball on Dec. 10th) looks as similar to Raymond Briggs' original animation as possible. The build-up to the snowman's awakening is laced with all the magic and intrigue that any fan of the book or the film could hope for. A giant clock is projected behind the sleeping boy and magic fizzes through the music as the clock ticks 'till the boy wakes. 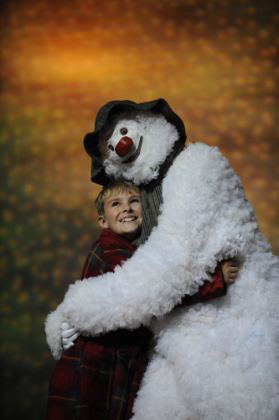 In a virtually wordless play the boy and the snowman make their acquaintance with each other and the other characters through gestures. Super-sized props are a delightful part of the set as the boy leads the snowman through his house. The refrigerator holds giant milk bottles (along with a few more surprises), and the Snowman curiously samples Dad's giant wooden pipe. A sleepy cat (Agnese Remolo) is the first of many animals we encounter, and many more emerge during a precarious motorbike ride through the woods including a fox, a rabbit, badger and squirrel. The animal costumes are lush and detailed, and the actors move appropriately, the cat slinks about and the squirrel fidgets. The house-tour which includes life-sized limboing fruit, such as an enthusiastically sashaying coconut, is as entertaining for the adults as it is for the children, who included an engrossed toddler mimicking the movements in the aisle. Howard Blake's magical, unforgettable soundtrack primes with the spectacular “Walking in the Air” sung by Susan Monnox. A hugely accomplished group of musicians, directed by Jeremy Young, sweep through the entire score with grace and eloquence. 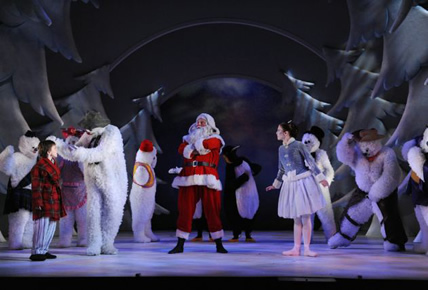 Upon reaching the longed for centrepiece they excel and the music underlies the first poignant flying scene as the Boy and the Snowman are lifted high above the stage, beginning their Arctic adventure. At this point, the Snowman is far from being the only one present who should be concerned about melting. On the subsequent trip to the Snowman's homeland the boy and the audience meet everyone from a pair of adorably clumsy penguins to Father Christmas himself. Luckily for those more susceptible to the heartbreaking, inevitable ending, it is cushioned amidst routines from the happy, energetic ensemble of the snow-people and the rest of the Arctic crew. Joseph Darcey-Alden is endearing, assured and spirited as the Boy. Ben Harrold puts in a star turn as the eye-wateringly flexible and beautifully costumed “baddie” Jack Frost and also plays the aforementioned coconut. The choreography by Robert North is full of energy and exceptionally true to the Christmas staple short film directed by Dianne Jackson in places. It is fitting that the only words spoken in the show are by the effortlessly popular Father Christmas who utters a deep “Ho! Ho! Ho!” in the second half, echoed by entranced children. Dance, mime and movement are otherwise responsible for communicating this story of a marvellous friendship and dream-like adventure. We left the theatre to a mismatched chorus of “Walking in the Air” being hummed, whistled and sung by various members of a satisfied audience for whom Christmas had officially begun.